On the final day of the ’11-’12 Ohio HS basketball season, with four champions being crowned, the stars were out in the hopes of becoming legends…. Kevin Johnson – ’13 Cincinnati Summit PG/SG: Dominating the game offensively is something that Johnson has done many times, doing so in the State Championship game while playing through foul trouble and shooting only nine shots is something different. The 6’2 combo guard played an excellent floor game by drawing help and dishing it underneath to big men, or to the corners to three-point shooters, for a game high 8 assists in Summit’s win. As athletic a guard as there is in Ohio in his junior class Johnson stunned defenders with hesitation moves and attacked the rim at top speed, scoring three times around the rim in the third quarter for the majority of his 11 points. When the hesitation move caused defenders to jump back “KJ” also showed his confidence in his shooting stroke, pulling up for a smooth jumper from about 17 feet and knocking it in. When Johnson plays with that high of a level of decision making there aren’t many better guards out there. 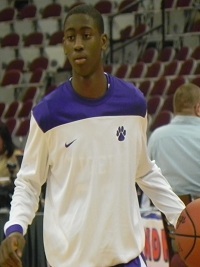 Caris Levert – ’12 Pickerington Central SG: The 6’5 guard just continues to move up the rankings with his ever improving all-around play. A big time shooter with a quick release that is able to hit a variety of shots Levert stroked jumpers off the dribble, including two mid-range jumpers off killer crossovers, and also hit shots curling around double-screens. Levert has really improved his handle, including his previously mentioned crossover, and now possesses a complete offensive arsenal of moves and scoring skills. Ohio University is getting themselves a great player in Levert who is only going to get better as he continues to add weight to his feet. 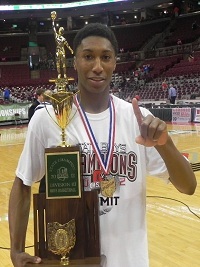 Levert finished with a game high 20 points in leading his team to a State Championship in Division I.
Nigel Hayes – ’13 Toledo Whitmer PF: Back to back baseline dunks early in the third quarter from the powerful 6’7 forward had the fans excited but it was the agility of Hayes, not the raw power, that impressed us. For the second day in a row Hayes showed off an improved handle, playing with patience and displaying good vision as to when to pick spots to attack the defense. Playing as his team’s top perimeter and post scorer the junior finished with 15 points, 9 rebounds, and 3 assists. Hayes was probably the most impressive player of the Final Four with his improving skill set, athletic abilities, and intensity. Reggie McAdams – ’12 Elida SF: The University of Akron got themselves a recruiting steal with McAdams, that cannot be overstated. The 6’6 wing showed that he can take over stretches of a game on the biggest stage as he scored 12 first quarter points, before finishing with a game high 24, in a two point loss to Dayton Dunbar in the D2 State Championship game. McAdams had his shooting stroke tuned in early as he knocked down four three-pointers in the game, all of them closely contested by taller Dunbar defenders. With his team’s guards being hounded into turnovers McAdams also assumed some ballhandling responsibilities and was able to create chances in the lane even against the quickest of defenders. With his high level athleticism and versatility on full display at OSU McAdams left no doubt that he is one of Ohio’s top talents. 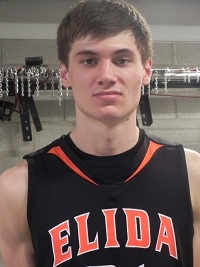 Dakota Mathias – ’14 Elida SG: The 6’4 sophomore really put himself on the state radar over the weekend with two good performances. In Saturday’s state final two point loss the wing guard showed the ability to handle pressure from smaller, and quicker, guards with poise; while still being strong enough with the ball to find teammates. Mathias finished with 4 assists and just 1 turnover against a trapping Dunbar defense as the primary ballhandler for much of the game. He also scored 16 points, including showcasing a pretty stroke indicated by 9/9 free throw shooting. Mathias is a crafty player who can play multiple positions and score from all three levels. He needs to get more athletic but he’s a guy Division II coaches should keep an eye on for the next level. Damarion Geter – ’13 Dayton Dunbar PF: The 6’7 forward is at his best when he’s using his length and great leaping ability to create havoc on the defensive end and the boards. Geter, who is also a very good ballhandler for his size, and a gifted passer, is a versatile offensive threat. The junior finished with 11 points and 5 rebounds in the win. Not a great shooter at this point he does have the capability to make mid-range jumpers; shot selection is going to be the key to his consistency. When he plays with that high motor he can be a tremendous energy player at the college level with the skill set and size to create mismatches. Deontae Hawkins – ’12 Dayton Dunbar PF: “Teddy” was not going to let his final game end in a loss. The 6’7 combo forward had another double-double by producing 14 points and 12 rebounds in his team’s State Championship win. By being able to shoot from the outside Hawkins was able to draw Elida’s Reggie McAdams away from the basket to create space for his guards to attack the rim. When McAdams wasn’t on him Hawkins used his length and athleticism to get on the offensive boards to finish plays around the rim. “Teddy” finishes his Dunbar career as a two time state champion. Taco Charlton – ’13 Pickerington Central C: The 6’6 post player is more then likely going to be taking the football route at the college level but he still is an effective basketball talent. In their state championship win Charlton totaled 6 points and 6 rebounds while doing a good job slowing down the even bigger Toledo Whitmer frontcourt players. With excellent strength and good athleticism Charlton showed off a high motor and toughness inside. Charlton is capable of scoring from the mid and low post with a turn-around jumper or a short jump-hook but is most effective on the glass on both ends of the floor. Leroy Alexander – ’12 Toledo Whitmer SG: The 6’0 senior combo guard scored 19 points, on 7/10 shooting, hitting a variety of mid-range shots in the lost art of the in between game. Alexander continued to show the athleticism that earned him a football scholarship to Nebraska with a first step that can get by just about anybody. In a game full of physical athletes Alexander was still one of the strongest and toughest players on the floor.